Poll: Will you watch the queen's Christmas speech? Following the goodwill generated during QEII’s first visit to Ireland this year, we’re asking if you plan to tune in to her annual address today. 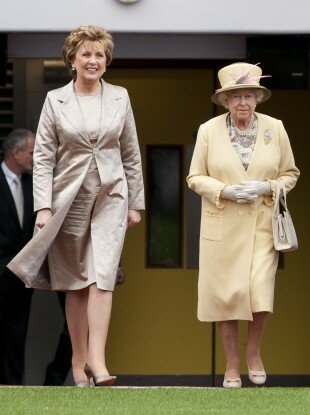 QueePresident Mary McAleese and Britain's Queen Elizabeth during the monarch's state visit in May. QUEEN ELIZABETH’S first official visit to the Republic of Ireland went off without a hitch in May. Over the four-day visit, she attended a range of events hosted by President McAleese in the capital, visited Cork city and the Rock of Cashel, and road-tested her cúpla focail. The first British royal Christmas message was delivered by the queen’s grandfather King George V in 1932 and that first speech was written by Rudyard Kipling. The speech’s contents are always a closely-guarded secret ahead of delivery, but rumours suggest that her Irish visit will feature. This year, Queen Elizabeth II’s Christmas message will be produced by Sky News for the first time, although the public address will continue to follow tradition in being broadcast at 3pm on Christmas Day. Following the goodwill generated during Queen Elizabeth’s four-day visit in May, will you be tuning in to her Christmas message this afternoon? Email “Poll: Will you watch the queen's Christmas speech?”. Feedback on “Poll: Will you watch the queen's Christmas speech?”.